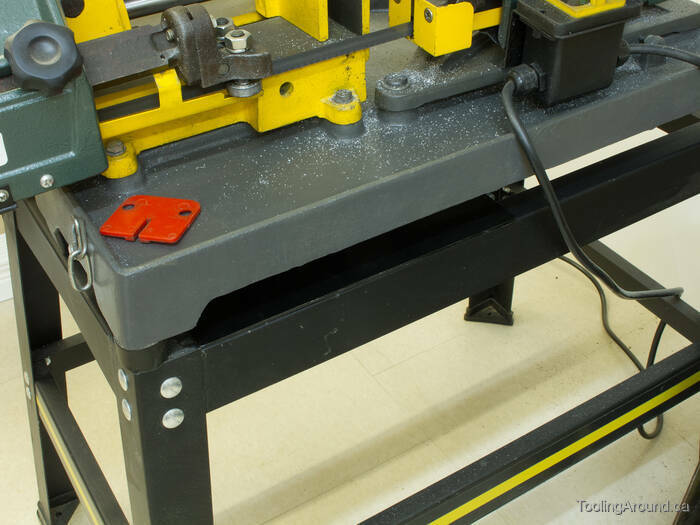 This is a very simple accessory, to store the table that's used when the bandsaw is in its vertical position. It's a shelf that sits on the bandsaw frame, under the main casting. Being black, it's hard to see in this photo. The shelf is just a bit of MDF, to which I glued some wooden strips. These, on the upper side, keep the table aligned on the shelf. These strips, on the under side, keep the shelf positioned on the frame. Here's the table, slid part way onto the shelf. This is a mouse-eye view of the shelf.